Wednesday afternoon we were thinking of what to have for dinner, and My Dear Wife called me, having just left work, and she wanted something warm since it had been cooler temperatures in the past few days, so she suggested making some couscous. I said what a great idea, so I threw together this recipe with some of the ingredients we had on hand. Moreover, forty-five minutes later when she arrived home, dinner was already prepared and waiting, this dish took all of about 25 minutes to prepare from prep to finish. I found some really good and fresh shitake mushrooms at the farmers market on Saturday, and they added great flavor to this dish. 1. Steam saute or sweat down the onion and garlic until translucent. 2. Add the mushrooms and stir well, continue to sweat down for about 3 minutes or so, and then add the spinach, raisins, vegetable stock, and remaining ingredients and stir well, and then bring to a boil. 3. Add the couscous and stir well, cover, and turn off the heat and allow to sit for at least 5 minutes. Fluff with a fork before serving. We added some roasted garbanzo beans to the top of this for some added beans and it also adds some crunchiness too. This recipe was prepared on Eat To Live, Week 4, and linked from Eat To Live, Week 4 Recap of our ETL diet and lifestyle, you can follow our complete progress at Eat To Live. The link to Week 4 Recap will be active soon. Hi Chef Ryan…this is so healthy and delicious too. Thanks for sharing the recipe. The spices used truly makes this dish great 🙂 flavorful !!! 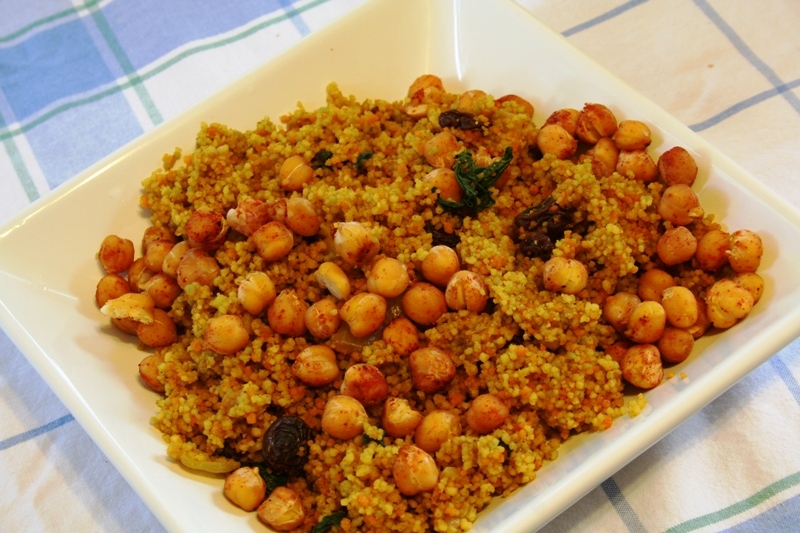 This couscous sounds amazing – what an excellent combination of flavors! I love the shiitake mushrooms and smoky paprika additions! Aren’t you the nicest husband ever! (Well, next to Poppa Trix.) A delicious and thoughtful dinner! I love couscous from breakfast to dinner. My French grandmother that grew up in Algeria often made her signature couscous dish with roast and cabbage and potatoes and carrots. I always love to find new uses for couscous. what a great idea and a marvelous mix of tastes! I’m going to have to try this. ohhh I’m loving this delicious light dish so healthy and hearty! Ryan, this looks absolutely delicious! what a fantastic combination of textures and flavors. i love making curry recipes, but the time it takes to do it right sometimes is quite a deterrent. this looks amazing! Oh I love curry flavored anything! I will definitely have to try this. I love this idea! I love curry so this will be on my list.